It is 34 years ago since the Society last had a lecture on the subject of the development of flying boats and seaplanes at Southampton and that was given by the late Alan Clifton who was a colleague and friend of the legendary Reginald J. Mitchell, chief designer for Supermarine. So it was a pleasure to have for our January meeting Colin van Geffin on the subject of ‘Ships of the Sky’. His very professional PowerPoint presentation was made to a full capacity audience who enjoyed the unfolding story of the central role that the seaplanes and flying boats, based primarily at Woolston on the Southampton Water, played in the nation’s aeronautical history. It was there that in 1912, Noel Pemberton-Billing formed the Super Aviation Works Limited, which was to take the name Supermarine, and built his first flying boat, code named PB1. This was an experimental aircraft which made its first flight from Southampton Water in May 1914. Development of the flying boat continued during the 1914-18 War primarily for the Air Department of the Admiralty. In 1919 the then current model, the Supermarine ‘Channel,’ became the first commercial flying boat to receive a British Certificate of Airworthiness. It led to the inauguration of a service from Woolston to Le Havre, the first international flying boat service in the world. Development of this type of aircraft continued apace. In 1923 Hubert Scott-Paine of Supermarine joined with the Southern Railway to form the British Marine Air Navigation Company Limited. In August of that year, using a Supermarine ‘Sea Eagle,’ a successful flight was made on the Southampton-Guernsey-Cherbourg route. In the following month a regular daily service began between Woolston and St. Peter Port, Guernsey. The ‘Sea Eagle’ was the work of R.J. Mitchell, the highly talented designer of many types of aircraft who will always be remembered in the annals of aviation for his design of the ‘Spitfire’ fighter plane, the prototype of which flew from Eastleigh in 1936. In 1924, resulting from a British Government initiative, Imperial Airways was formed by the merger of several companies including the British Marine Air Navigation Company Limited. Imperial Airways was to pursue the economical development of British commercial air transport and Hubert Scott-Paine became a director of this new company. The development of flying boats continued as did the opening of new international routes. The industry was given a major fillip in 1935 when the Government decided to carry all mail within the Empire without surcharge. In response Imperial Airways ordered 28 Short S23 ‘Empire’ flying boats each carrying a payload of 1½ tons of mail and 24 passengers. Routes were now opened from Southampton to Egypt: East and South Africa: India: Malaya: Hong Kong and Australia. In 1937 a route to New York via Botwood and Montreal was also established. The speaker described in some graphic detail the 10-day journey to Sydney. The flying boats were built to provide the maximum comfort and luxury for all passengers: meals were of the highest quality and overnight accommodation was provided in first class hotels. World War II brought a change in activity, the ‘Walrus’ being built for the Fleet Air Arm in large numbers at the Supermarine factory until it was destroyed by enemy bombing in 1940. The building of maritime aircraft was then dispersed to various places around the country. But the War effectively brought an end to the commercial flying boat. Jet engines had been invented which significantly reduced flying times and many countries had built strategically located airfields giving much easier access to commercial centres. 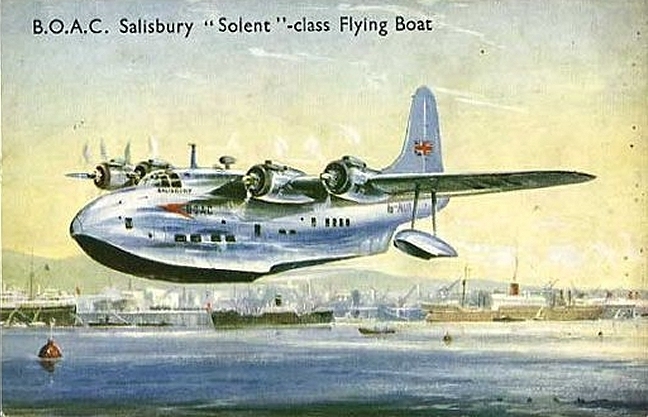 The advantages of flying boats were therefore at best much diminished and at worst non-existent In spite of efforts of several companies, the flying boat could not be made an economical alternative and in 1958 the last commercial service run by Aquila Airways, Southampton-Madeira, was discontinued. This interesting, enlightening and professional talk was much enjoyed by the audience. The next meeting of the Society will be held on Friday 24 February and the talk will be given by Angela Trend entitled ‘Lyndhurst Church’ the story of a Victorian Treasurer House. Visitors very welcome.